B2B online recharge API service provider in Jaipur Rajasthan,India. your brand name on a service. International Mobile Phone TopUp API Solution. Want Higher Margin On Electricity Bill? Start Your Own Business with CrowdFinch! The name CrowdFinch came to mind when one thinks of trustable multi recharge API services and Software Solutions in India. It is one of the leading companies in India who helps its clients with developing a website or software with API integration and help to get good ROI. Its professional team of skilled technical engineers is expert in B2B API Integrations and software development. We are extremely flexible in the way we handle our communications and business with our clients. We believe in forging meaningful relationships, strong work ethics and always look forward to fulfilling all our professional commitments within the stipulated time frame. 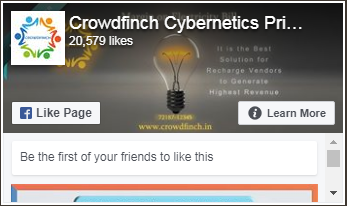 Crowdfinch Cybernetics Pvt Ltd. Present a business opportunity to create and grow your recharge and payment business with advanced mobile recharge, billing software and mobile recharge API. We also produce custom software as per client requirements. Your Business opportunities are just one click away. Just click and launch your own website or software for electricity recharge, travel booking and mobile recharge of all companies. Crowdfinch provides all prepaid network recharge services with maximum commission on minimum investment. Crowdfinch is a B2B portal which various API services. Crowdfinch provides all postpaid network recharge services with maximum commission on minimum investment. Crowdfinch is a B2B portal which various API services. DTH is a technology to broadcast Television signals. In DTH or digital TV all TV programmed is coded into a binary code like a computer.With this DTH technology picture. Crowdfinch provides all landline network recharge services with maximum commission on minimum investment. Crowdfinch is a B2B portal which various API services. Insurance is a contract of protection between insurer and insured, where insured can be individual or entity. Insured person or entity minimizes their risks by some small amount. Join Crowdfich for complete travel booking solution with Flight booking, Bus booking, and Hotel booking. We integrate API to your travel booking portal. 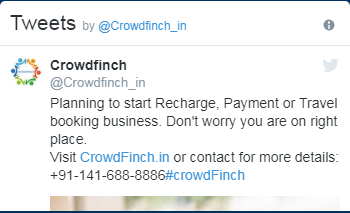 looking To Increase Your Business Revenue?Crowdfinch Software and API helps your business to grow faster in Recharge, Bill Payment, Travel booking, and Money Transfer. Start your own mobile recharge business with Crowdfinch’s mobile recharge software, where you will get a complete ready to use software, Android Application, and SMS based Recharge for your recharge business. We provide the least expensive bulk SMS services in India. We are highly capable of providing long code dedicated services at lesser prices than our peers. Offering Travel API with quick booking response, with our API integration you can earn more commission on each travel booking. We serve you complete API solution of Flight booking API, Hotel booking API and Bus booking API integration services. Get your mobile recharge API which is Hassel free, easy to use, fast and secure, which includes all Indian mobile network recharge, utility bill, and Insurance payments. Join Crowdfinch a fastest and easiest mobile recharge API provider in Rajasthan, India.